Whenever I’ve considered which beauty product I would love to wish into existence, I dream about sunscreen. Specifically, sunscreen that can be reapplied over my makeup without messing it up. For context, I am an SPF fanatic — but I’d be lying if I said I reapplied the stuff as often as is recommended by dermatologists: every two hours, especially if you sweat (which I do, every single day on an overcrowded NYC subway car). I know I’m not the only makeup-wearing person who doesn’t reapply SPF as often as I should. In fact, most people only incorporate the stuff into their morning skincare routine — if at all (if the latter sounds like you, read this to learn more). In an increasingly SPF-centric world, it makes sense that brands are finally creating cosmetically-elegant solutions for those of us who skimp on reapplying. 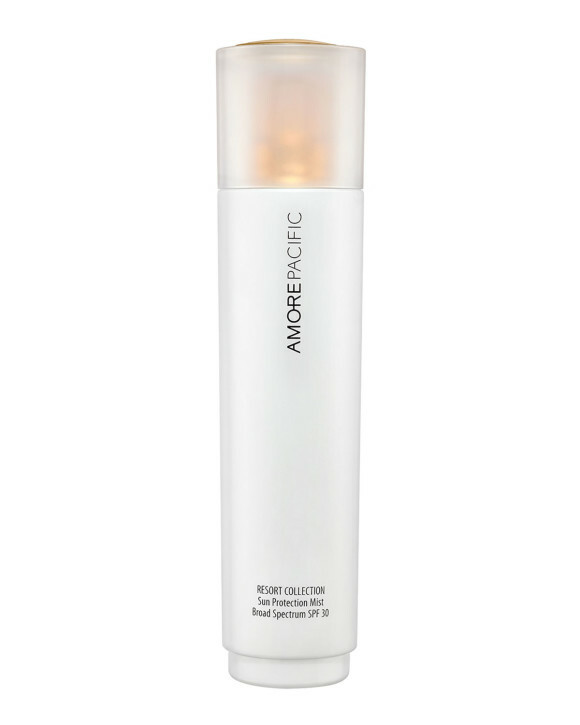 I recently discovered the AMOREPACIFIC® Resort Collection Sun Protection Mist ($32) — a sunscreen spray that’s so good, it leaves absolutely no room for excuses. In fact, I’d go as far as to say that it’s a pleasure to apply. First, it doesn’t smell even remotely like traditional sunscreen. Instead, it has more of a light, indistinguishably cozy scent. Next, it contains a whopping SPF 30. Most importantly, it really, truly works over makeup — thanks in part to the fact that it’s a chemical sunscreen. So it doesn’t run the risk of leave an unflattering white cast. Plus, has a dewy — but not greasy — quality that makes my skin look like I just applied a super-hydrating moisturizer and drank a gallon of water. And the formula might actually be making my skin look more radiant, thanks to infusions of redness-calming mushroom and hydrating bamboo extracts. As much as I love this stuff, it is worth noting that it shouldn’t replace your daily morning sunscreen altogether. According to dermatologist and medical content reviewer for the Skin Cancer Foundation, Dr. Mona Gohara, the only way to glean the optimal level of sun protection from a mist is to spray the product into your hands first before applying (that way, it’s more concentrated). Nevertheless, she notes, “I encourage people to use whatever formula they prefer as long as they reapply every two hours.” And — let’s be honest — sunscreen is a lot easier to re-apply when it keeps your contour intact and adds a shot of dewiness to boot. Products may have been gifted to the author for the purpose of writing this article.